Crow, dammit, Crow. Box 3 and the final part of Triptychos is heart-shaped and Schiaparelli pink, except for the outside of the lid. 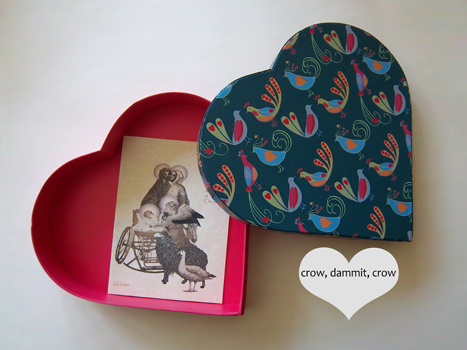 The box, 21 cms across and 4 cms deep, has a teal coloured lid decorated with colourful peacocks adorned with hearts instead of eyes. When you open the box you will find, not a love letter, but a Christmas card. Mary and Joseph hold each other anxiously as the baby in the wheelchair peers up at them. The angel is of course, adoring; the sheep proprietorial and the goose indifferent or just looking for the way out. and walk, to be the hero. I just wanted to hear it crow.